In this issue, we are highlighting the automotive industry and you will find specific articles on this topic. The auto industry is huge and complex and the technology changes are driven, to a large extent, by the European standards. So, it is common to see suppliers guaranteeing performances from their technologies to meet these increasingly stringent criteria. Quality assurance in the paint shop is of extreme importance, because the paintwork on a car body needs to be just perfect. Even the tiniest blemish is regarded as a product defect, and is unacceptable to both vehicle manufacturers and consumers. In quality assurance, despite even greater automation in a quality control, machines are no match for the human eye when checking a paint finish. For this, ergonomically well-equipped workstations are needed, such as Eisenmann VarioInspect LED light tunnel. VarioInspect is designed to facilitate and improve the final inspection process for body paintwork, and it also lowers total operating costs. Kässbohrer PistenBully snow groomers are now being painted by a Dürr robot. This halves the duration of the painting process, because application by robot is much faster than manual application by a worker. For the internationally leading manufacturer of specialist vehicles for slope preparation, automating the process means greater efficiency in production and less exposure to paints and solvents for workers. ZECCOAT chromium-free passivation technology was introduced. Carrying out a salt spray test (NNS), white rust time was 96-168 h for alkaline zinc plating, 96-120 h for acidic zinc plating, 240-360 h for alkaline zinc-nickel alloy plating, and 192-384 h for alkaline zinc-iron alloy plating, when ZECCOAT passivation was directly used. The white rust time was 648-936 h for alkaline zinc plating, 192-504 h for acidic zinc plating, 240-480 h for alkaline zinc-nickel alloy plating, and 648-672 h for alkaline zinc-iron alloy plating, when trivalent chromium passivation and following ZECCOAT passivation were used. The ZECCOAT passivation technology is advanced, in which nano technology was used, the passivation solution is innoxious, the passive film is thin and has self-repair property, and corrosion resistance of the passive film is excellent. Performance of ZECCOAT passive film and the passivation cost are consistent with trivalent chromium passivation with the addition of sealing. In general, most current efforts at improved energy efficiency and technology adoption in the surface finishing sector are being driven by legislative requirements and customer demand. An optimal energy scenario for the industry would involve increased energy efficiency through equipment and process improvements, as well as increased investment in the development of new energy-efficient technologies and processes. SFCHINA2018 (The 31st China International Exhibition for Surface Finishing & Coating Products), closed its gate on Dec 6 at Area A of the China Import and Export Fair Complex in Guangzhou, P. R. China. 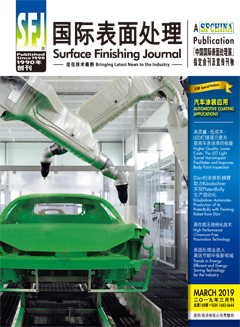 The leading surface finishing show reported encouraging results again this year with the continued support from the industry. — Fredrik Walldal, Managing Director, KraftPowercon, Inc; Felipe Atti Dos Santos, Industrial Manager, Cromofix Cromo Duro Ltda. Choosing the right rectifier to power your plating process can have a big impact on your business’ performance. Yet, to many metal finishers a rectifier is just a black box providing DC power to an electrochemical cell. While this may be true to some extent, there is a lot more going on than meets the eye. The purpose of this article is to present the most important performance parameters influenced by the choice of rectifier and outline the impact this can have on any metal finishing business. Clean-up in China is Real! It is hard to believe that in some provinces, especially near the big cities, where, for example, the limits for heavy metal discharges in liquid wastes are as low as 0.1 ppm. Government regulators are endeavouring to push towards zero discharges. This is a major shift and it will put real pressure on many operations. Last time we stated that ’the new environmental crack-down has teeth’: best we believe this and act now! Heraeus receives Kyocera "Best Supplier Award"